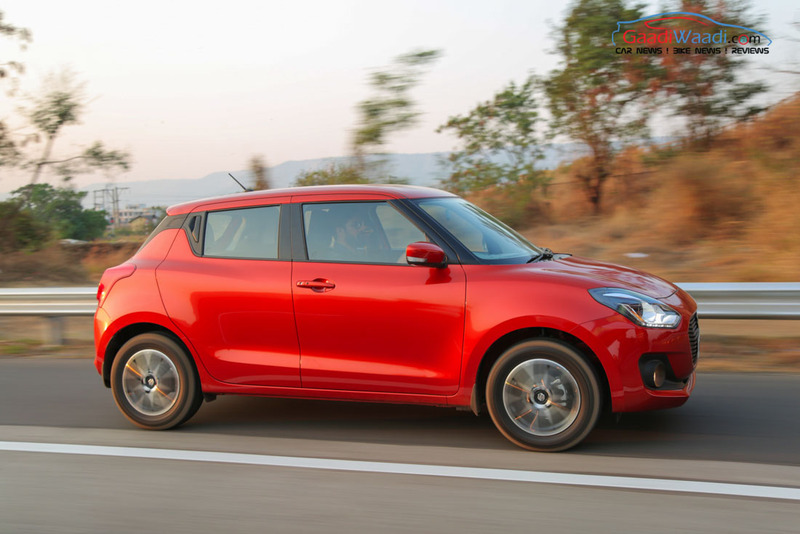 Maruti Swift has been a very special car to the Indians for a lot of reasons. 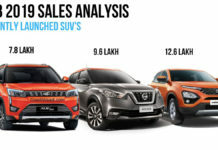 Despite increasing competition, popularity of this hatchback has been always high and it has sold nearly 17 lakh units in India in the last 13 years since inception. 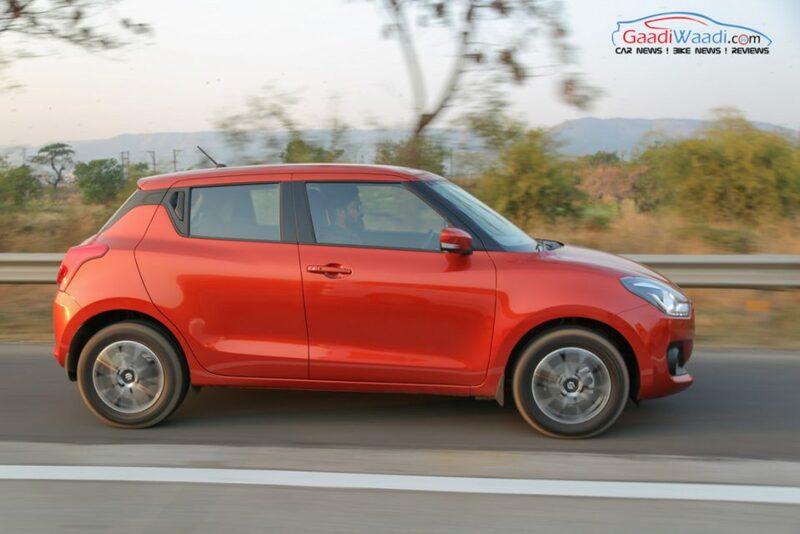 Around 7 years ago, Maruti Swift received an updated avatar in the form of the second generation model. Now, the third generation model is here and it comes bearing the most changes in the nimble hatchback’s entire lifecycle. 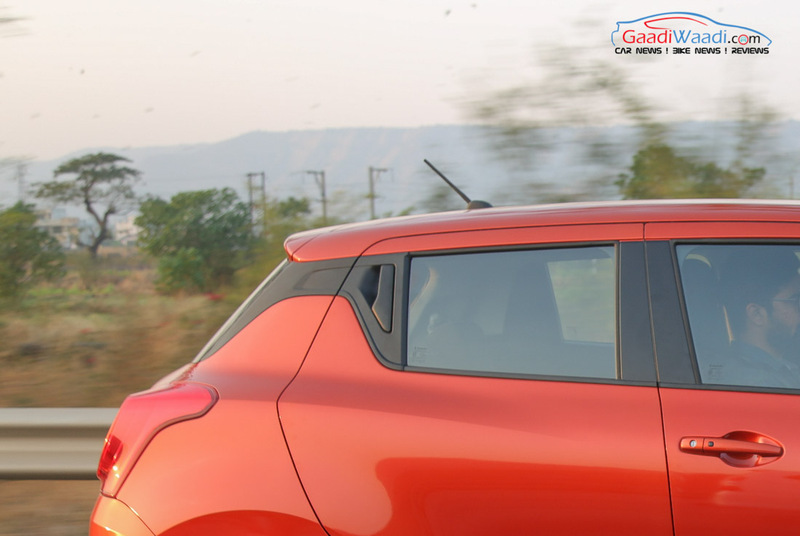 The main reason behind the high demand of this B-segment hatchback has been its design. 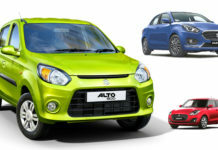 The new Swift too has been designed keeping the fact in mind and it gets sportier and more premium look. At the first glimpse, it appears completely new and compared to the old model, the new Swift looks smaller. The car is built on Suzuki’s Advanced HEARTECT platform that brings several changes in its dimension. Length of the car has been reduced by 10 mm and width has been increased by 40 mm. Engine compartment has become smaller and thanks to that move wheelbase of the car has been increased by 20 mm. Bootspace has also been increased by 58-litre compared to its predecessor. Despite shortened length, new Swift offers better legroom, about which we were complaining after the arrival of new cars in the segment. 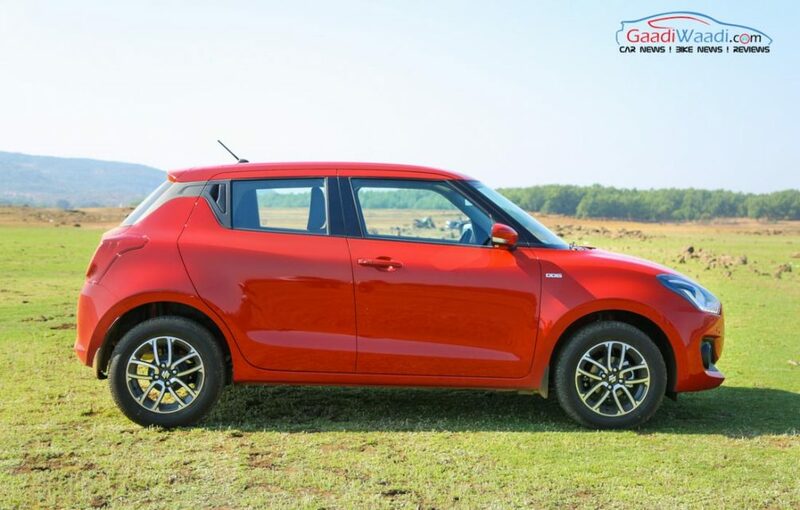 The new Maruti Swift measures 3,840 mm in length and 1,735 mm in width along with a wheelbase of 2,450 mm. The car stands 1,530 mm tall as well. Speaking about boot storage, it offers 268-litre of capacity. 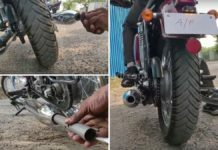 However, ground clearance is decreased by 7 mm to 163 mm. If we glance over the car from the front, it looks pretty good. Radiator grille has become larger and it features several sharp fins. Fog lamps are connected by a single piece black element and it adds a sporty character to the overall front profile. 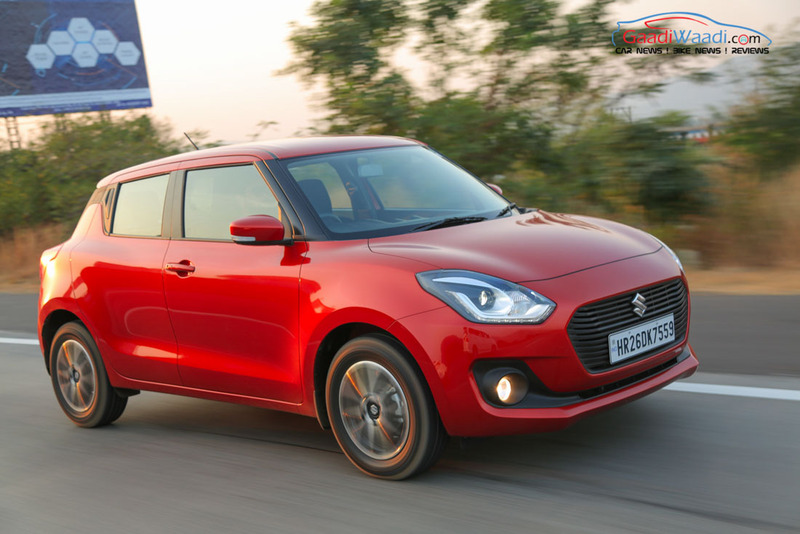 Top two trims of the new Maruti Swift come with fog lamps as standard. 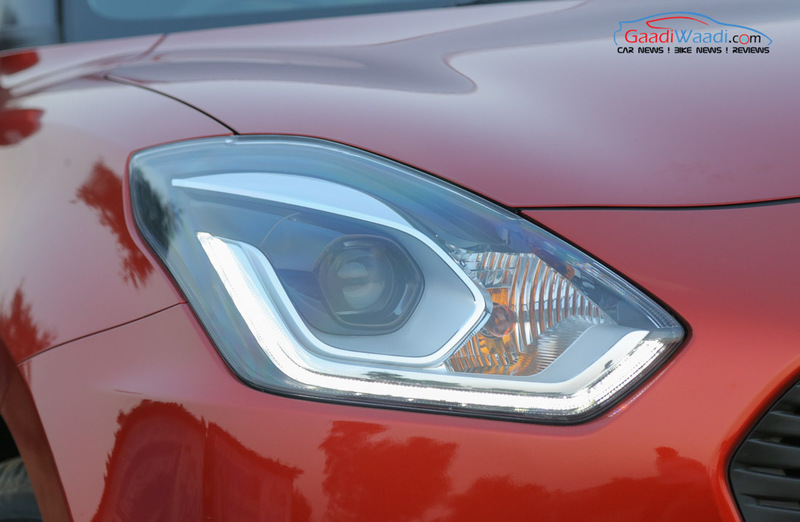 This is the first time, Swift has received projector headlamp and LED Daytime Running Lights. Overall, the front fascia looks pretty sporty. At the side profile, it looks quite similar to the second generation Swift. Thanks to the floating roof, the car gets an aggressive stance. Window glasses come larger than before, but the quarter panel glasses have been replaced by pillar mounted rear door handles. Positioning of the rear door handles would probably remind you of Chevrolet Beat. Side panels don’t get many creases and hence they come simple and sober. 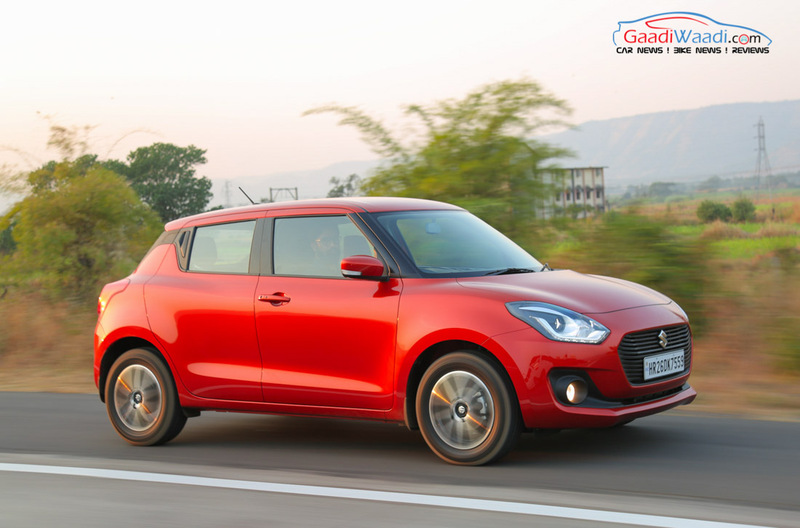 Thanks to the new two-tone precision cut 15-inch alloy wheels, the new-gen Swift boasts a premium appeal. 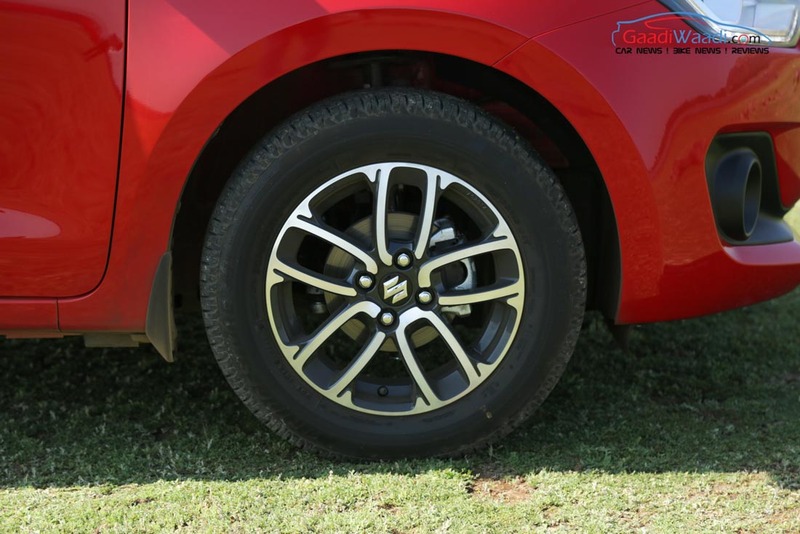 However, the 15-inch alloy wheels are available only in ZXi and Zdi trims. Lower variants get 14-inch steel wheels. Overall, new Swift’s side look is pretty attractive and eye-catching. 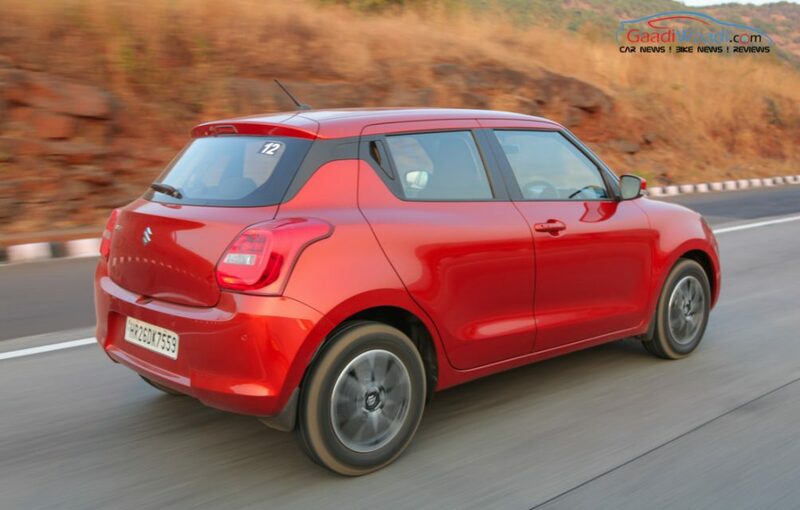 If we talk about rear design, the new Swift appears with a perfect supermini stance. The boot door glass has been shortened than before. 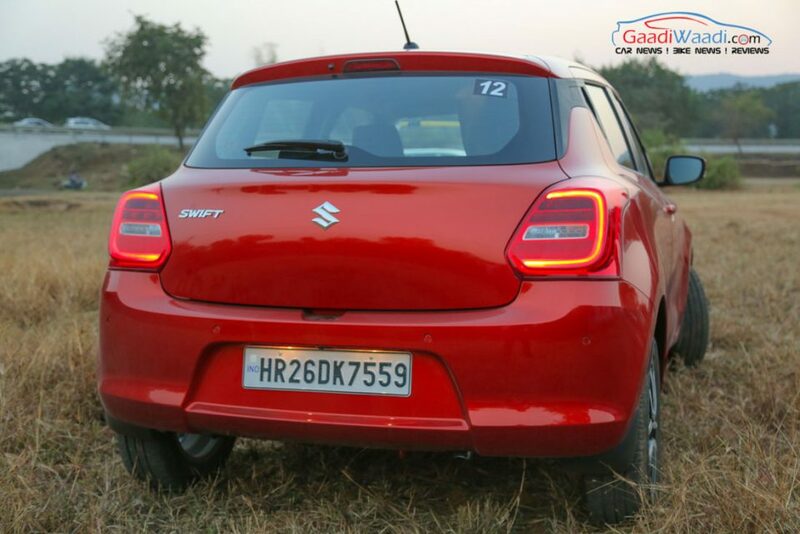 Compared to second generation Swift, the new model gets full LED taillights. 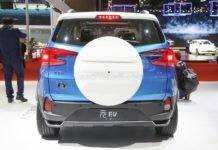 Instead of vertical design, the taillights come with a squarish appearance and its rear reminds us of the Datsun Go hatch. 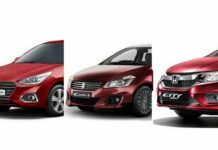 If we talk about overall design of new Swift, its front, side and rear profiles are pretty attractive and made the new Swift a head turner for Maruti. 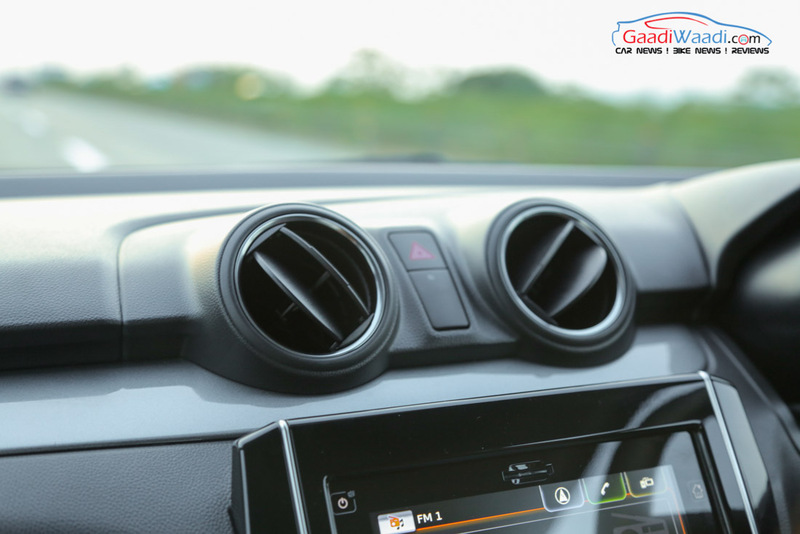 The moment you sit inside the cabin of new Swift, you will feel the freshness. 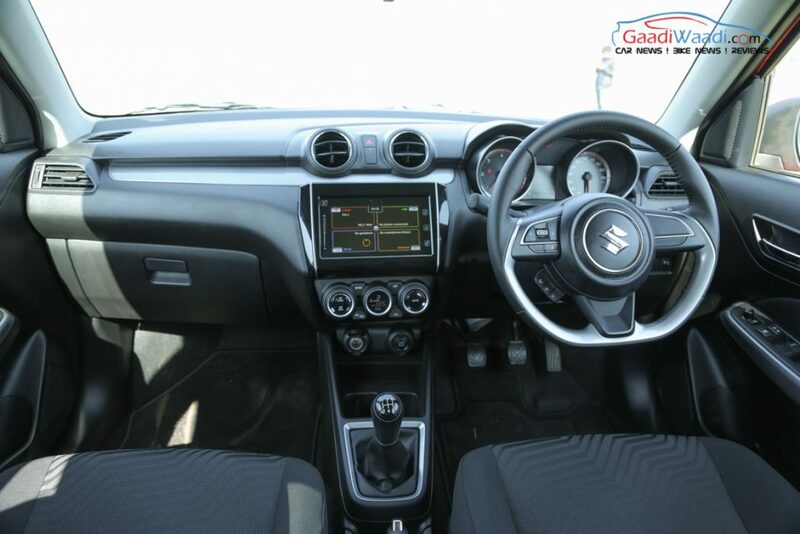 Entire dashboard appears similar to the latest Maruti Dzire, except for the centre console. 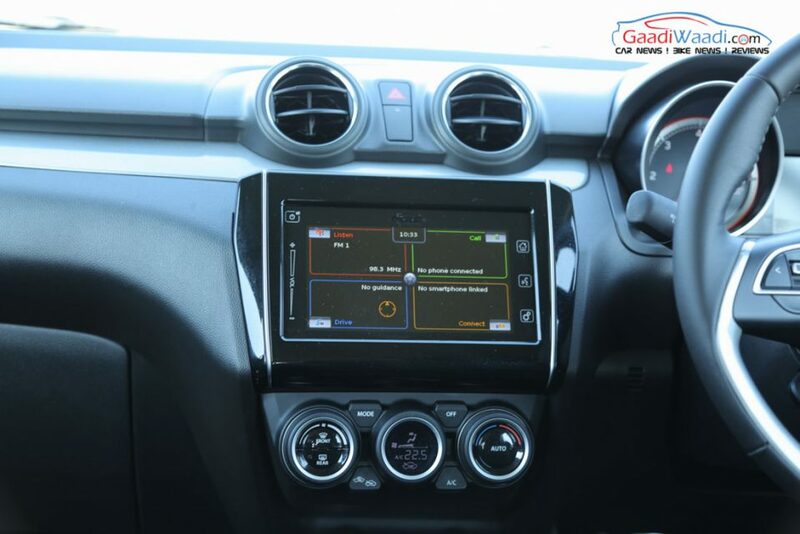 However, instead of black and beige colour combination of Dzire, Swift comes with pure black theme. New Swift features flat-bottom multifunction steering wheel that perfectly complements the sporty character. 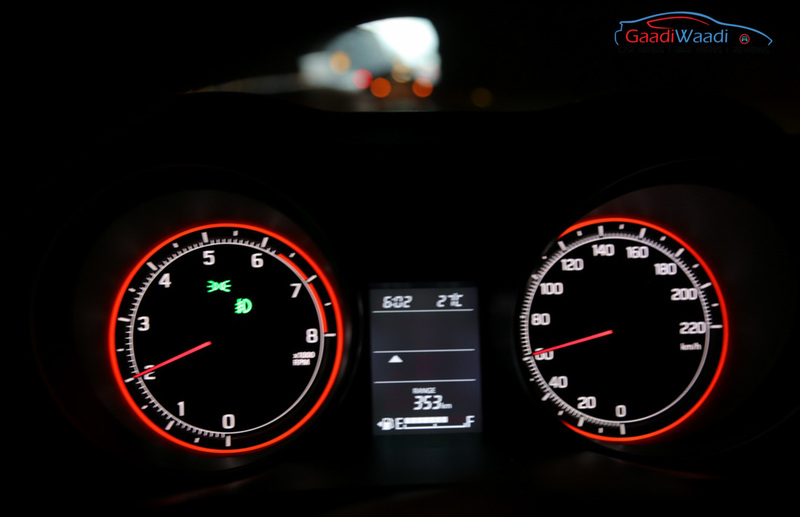 The red illumination in the speedometer gives new Maruti Swift an aggressive feel. 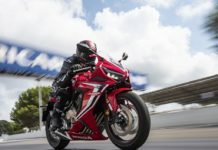 There are audio and telephonic controls on steering wheel, but the India-spec model doesn’t get cruise control that is offered in the global version. Apart from that, new Swift gets all those features that are available in Baleno premium hatchback. 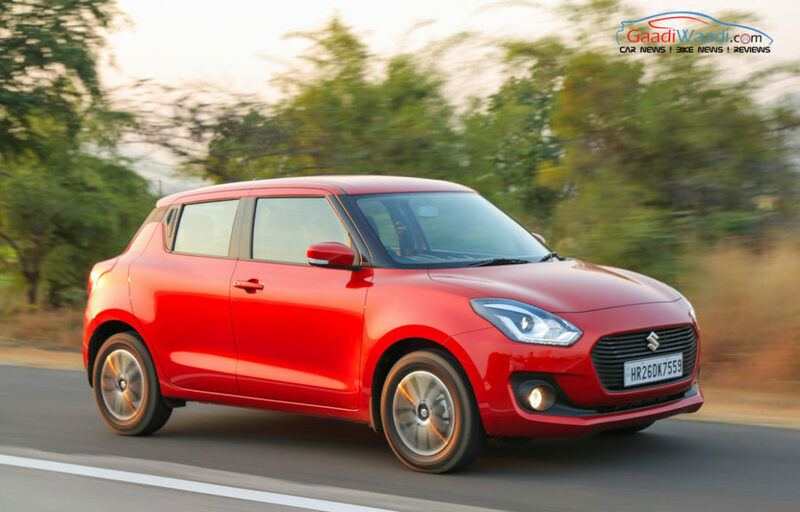 The 2018 Maruti Swift also gets features like advanced keyless entry, push start button, auto climate AC control, touchscreen infotainment system with Apple CarPlay and Android Auto and reverse parking camera for the very first time. It also comes with all those safety features that save lives and all safety features are standard right from base end ‘L’ trim. 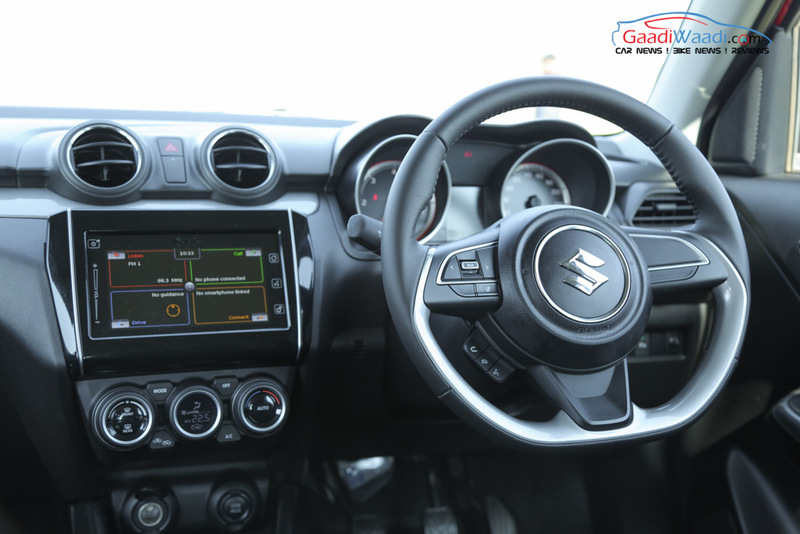 Along with dual front airbags and ABS, Suzuki TECT technology has been used in this car. Its structure has been built keeping side impact safety along with pedestrian safety. 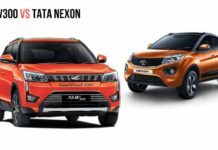 This car complies with all those safety norms that will be in effect from October 2018 in India. 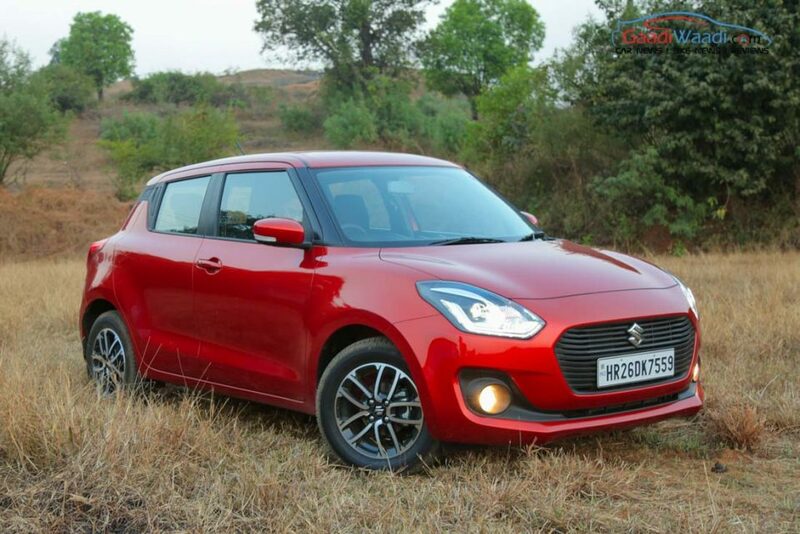 The new Swift gets the same 1.2-litre petrol and 1.3-litre diesel engine from the familiar range. 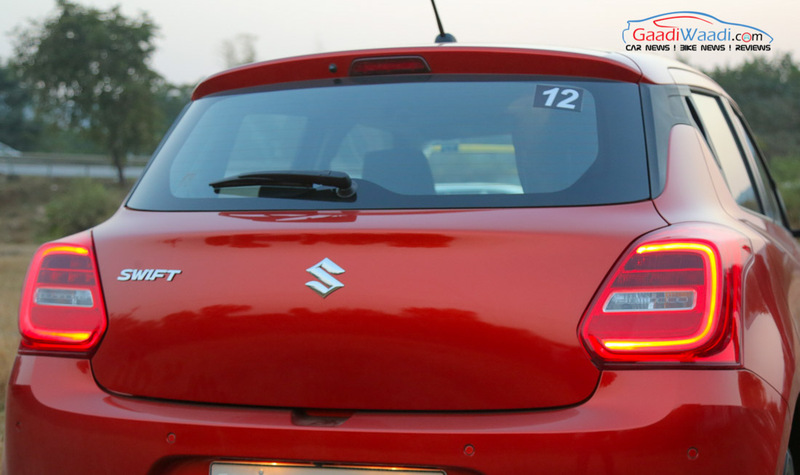 We drove the swift diesel manual variant first, which is the most favourite amongst the Swift lovers. It is the soul of the Swift’s sporty character. If you have driven the second generation Swift, then you will feel better power to weight ratio in the new model instantly. We drove the diesel AMT variant as well but didn’t like that variant much as the manual. If it had a ‘Sport’ mode, then it could have been fun to drive. 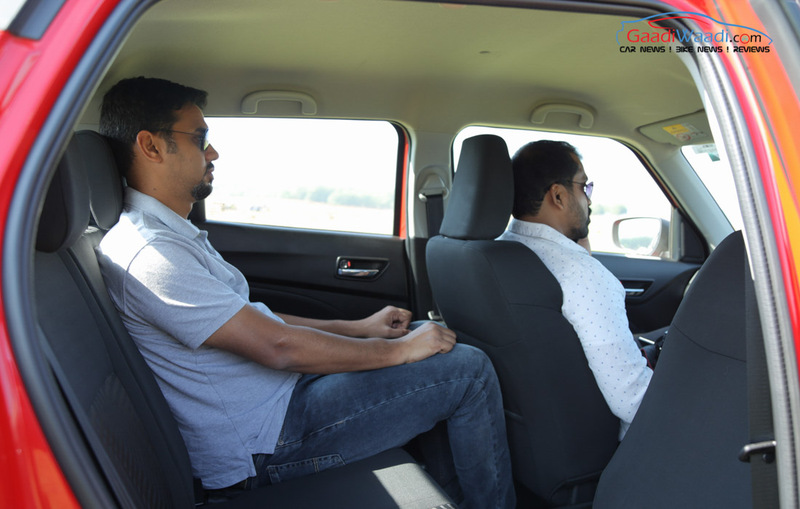 But yes, if you regularly drive a lot and that too through bumper to bumper traffic, then AMT gearbox will surely make driving effortless. 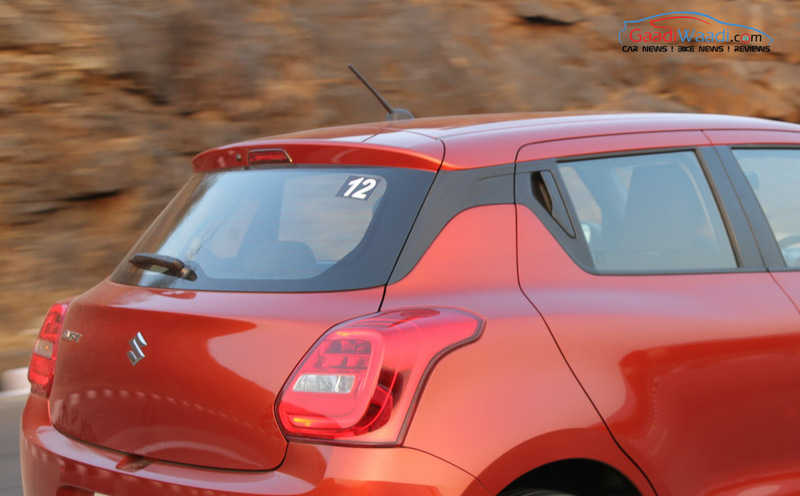 If you are looking for fun experience, you can shift the gear lever to manual mode and enjoy driving the Swift AMT variant. 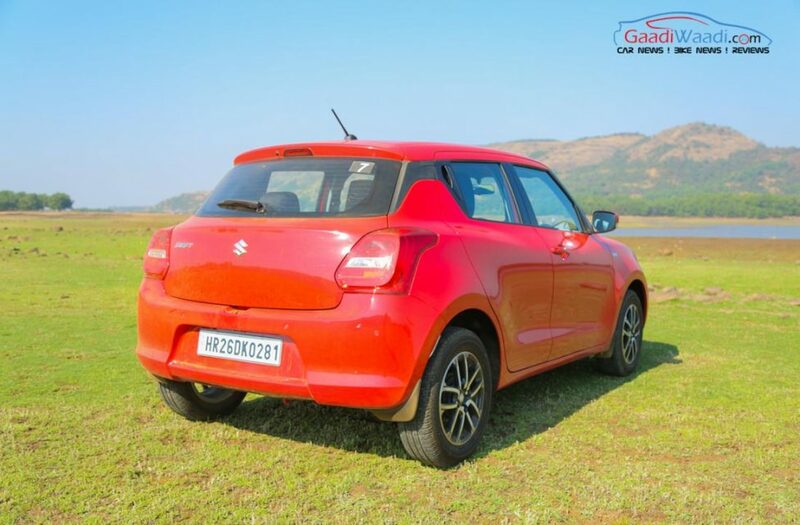 Though the new Swift has gone through lot of changes, you will feel turbo-lag in this diesel version as well. Talking about the Swift petrol, we liked both the manual and AMT variants. The AMT version more than manual variant in fact because its driving experience is pretty effortless. You have to pay only around 50,000-60,000 extra to buy the AMT variant or to say otherwise, to afford the effortless driving. 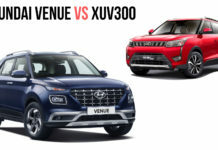 You will like both the petrol manual and petrol AMT variants, as both of them comes with improved NVH level and offer smooth and peppy performance. Speaking about fuel economy, Maruti claims the petrol motor offers 22 kmpl, while the diesel model returns 28.4 kmpl. 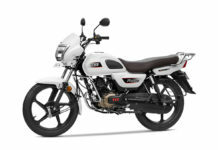 The petrol motor is available with 5-speed manual gearbox and there is an AMT on offer. The engine kicks out 83 PS of peak power and 113 Nm of peak torque. On the other hand, the diesel variant too is offered with a 5-speed manual gearbox and there is an AMT as well. It pumps out 75 PS of peak power and 190 Nm of peak torque. Now speaking about the driving dynamics, this area received the major change along with the design. 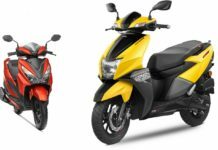 Besides enhancing sporty character, its ground clearance has been reduced slightly to 163 mm, while the width has been increased by 40 mm. On-road stability of the hatchback has been improved significantly. You will surely like the new Swift’s steering wheel as it gives smooth feedback and during cornering it provide great confidence. 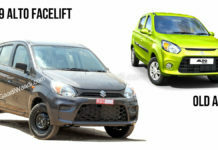 New Swift will surely bring smile to performance focused drivers’ face, when they will drive it. 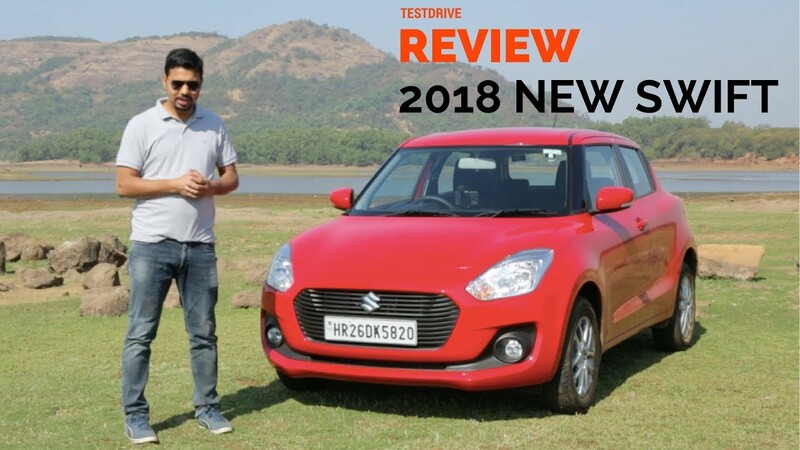 On the suspension front, 2018 Maruti Swift has seen pretty good improvement. Same platform based Maruti Baleno draws slight criticism regarding its suspension, but in Swift we didn’t find anything to complain. The car has seen pretty good improvement in body roll. This is certainly good news for the rear seat occupants. During driving you will feel the absence of armrest. While no car in this segment comes with driver armrest, new Swift could have received that as it has already become pretty much premium. The braking feel has grown a notch higher due to the modifications incorporated. 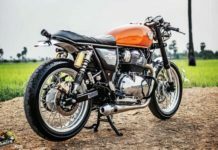 The manufacturer has kept the fact in mind that almost all the Swift owners have complained about poor braking power in the previous generation model. 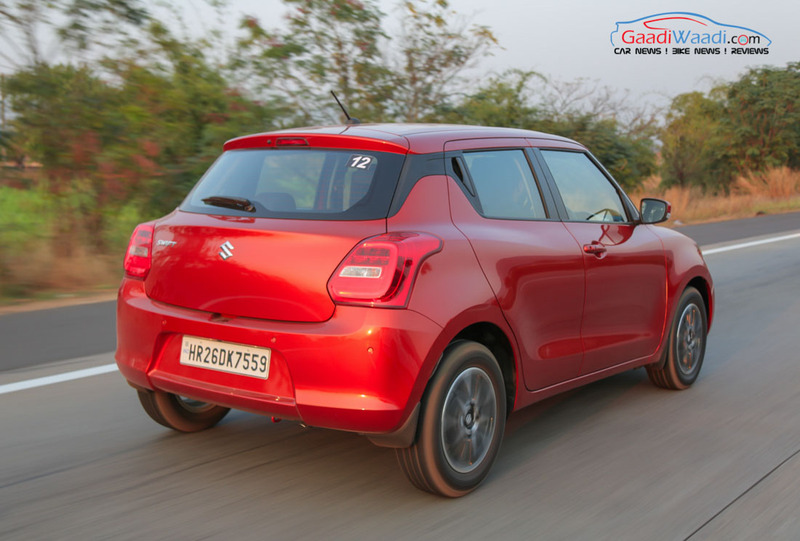 To be honest, in terms of driving dynamics, the new Maruti Swift is far ahead than any other car in this segment. Be it brake, be it steering or stability, everything has been improved for good. Suspension too has been behaving pretty well as its weight was reduced significantly. Overall, you will feel the biggest change Maruti Suzuki has made in the driving dynamics section. After spending around 24 hours with the new Maruti Swift, I was pretty impressed by the car. It’s the sporty design and the all-black interior, but I was very impressed by its driving dynamics too. I felt big changes in the steering response, braking, stability and handling of the new Swift compared to the second generation model. So far, in terms of driving dynamics, this is the best hatchback from Maruti. I drove all the four variants of the car. While I liked the petrol manual and petrol AMT variants, I feel the diesel manual variant will be able to sustain its popularity. If you are a performance focused driver, you may not like the diesel AMT that much. 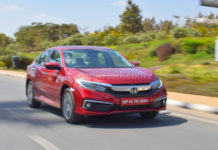 Floating roof, projector headlamps and LED Daytime Running Lights have given this car fresh premium feel and this will surely become a new head turner in town and wherever it goes. I feel the new Swift could have received driver armrest and telescopic steering wheel, at least in the top-end ZXi+ and Zdi+ trims though. 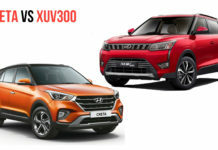 It will throw tough challenge to Hyundai Grand i10. 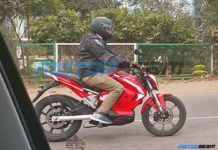 Also, it will give Hyundai Elite i20 and Maruti Baleno nightmares. 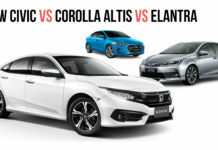 Don’t be surprised if it tops the best-selling chart overtaking Alto in the coming months just as what its sedan sibling did a while ago.